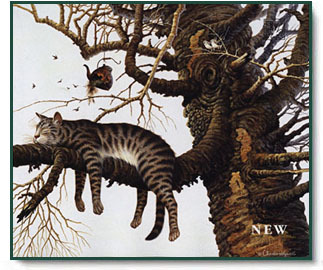 "Our cat Mabel assumes this position from time to time on the rim of our love seat in the den," the artist relates. "I knew I would capture this pose on canvas someday. Her love for climbing trees made her the perfect model for this work. Putting her outside, hanging on this limb made a nice silhouette, with the testy mockingbirds upstairs ready to peck and irritate. It was a tempting location for a sleeping cat and proved to be great fun to compose and paint." This has been a favorite Wysocki image for years, and is now available as an open edition print. Do you know someone who is too pooped or busy all the time? This print is sure to send some well deserved laughs their way. Maybe that busy person will sit down and relax for a moment to appreciate the real humor this piece portrays. It seems we are all a little "Too Pooped" once in awhile. Why not make fun of being tired! 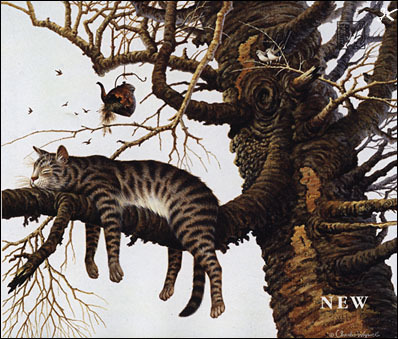 Too Pooped to Participate copyright © 1999 by Charles Wysocki.